Obtaining Florida Commercial Auto Insurance Quotes Online is easy with Click & Save Insurance. Find the most affordable Florida Commercial Auto Insurance available based on your unique business needs. Our team of business insurance professionals are here to assist you. Call us today at 1-813-643-7770 for all of your Florida Business Insurance needs, or click here. Florida Commercial Auto Insurance is similar to your personal auto policy in a few ways, however there are big differences in coverages, exclusions, definitions, limits and eligibility. Florida Commercial Auto Insurance is written and rated differently. It is also required for certain operations and specific vehicle types. Is your business transporting goods or people for a fee? 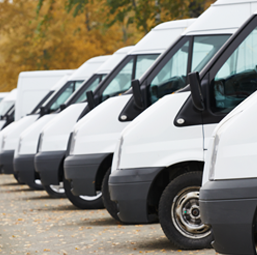 Is your company using your vehicle to conduct a service? Do your employees operate a vehicle? If so, you may need a commercial vehicle policy. What does Florida Commercial Auto Insurance cover? Florida Commercial Auto Insurance provides some similar coverages as your personal policy. These coverages include liability, collision, comprehensive, medical and uninsured motorist. There are major differences when you get into the details of exclusions, definitions, limits and eligibility. What Florida Commercial Auto Insurance coverages are available? Bodily injury liability coverage covers bodily injury or death resulting from an accident where you are at fault. Property damage liability coverage covers you if your commercial vehicle accidently damages another person’s property. Combined single limit (also known as CSL) policy has the same dollar amount of coverage per covered occurrence whether bodily injury or property damage & one person or several. Medical payments, no-fault & personal injury coverage can pay for the medical expenses of the driver and passengers in your commercial vehicle, regardless of fault. Uninsured motorist coverage covers incidents where the at-fault driver has insufficient insurance or no insurance. Comprehensive physical damage coverage protects you from damage to your commercial vehicle from theft, vandalism, flood, fire, etc. Collision coverage protects you from damage to your commercial vehicle when it hits or is hit by another object. In many cases you are provided with a legal defense with your coverage.